Click here to submit a suggestion, correction, or an addition to this list. Charles Brady III -Chair Charles Brady III is currently the Regional SCAUG President & the Chair of the OK SCAUG Steering Committee. He has been involved with SCAUG for over 11 years. During his time as a SCAUG officer, Charles has been heavily involved with the set up and maintenance of the current SCAUG website and the online registration systems. Charles has continuously served as vendor coordinator during the past 6 regional conferences recruiting and coordinating vendor sponsorships, booth displays and vendor ads. Charles worked for the Garvin County Assessors Office & Carroll Land Surveying while attending college at East Central University. He graduated from East Central University with a bachelor degree in Cartography in 1999 and has worked for the City of Ardmore as the G.I.S. Coordinator since 2000. During this time Charles has served on both the Oklahoma Chapter SCAUG Steering Committee & the Regional Board of SCAUG in various positions. Charles & his wife of 11 years Penni have 2 children, a 7 year old son Charles IV & a 3 year old daughter Calin. Brad Nesom - Conference Coordinator Brad works for Hiland Partners, a gas midstream company in Enid. 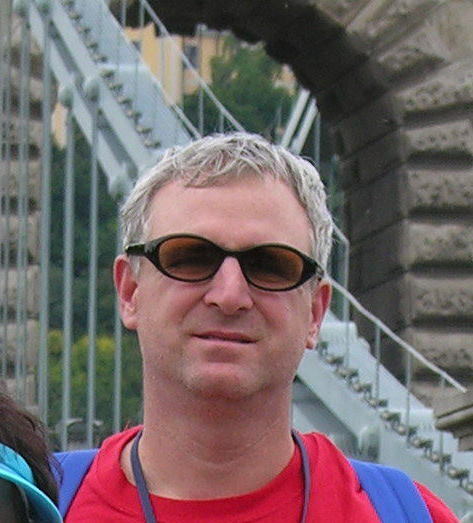 His expertise is in database management, project management and design. His 20 years of experience have been woven with many water/GIS issues from the vantage point of State, Local, Regional, and private industry. While currently charged with developing data and applications for gas and crude gathering systems, he enjoys spending time hiking and camping with his wife and four children. Willard Gustafson - Publications Coordinator Willard is a Senior GIS Specialist for Meshek and Associates PLC, an Engineering and GIS consulting firm in Tulsa. He earned a Masters in Geography with an emphases in GIS & Cartography from The University of Montana and has been working with GIS since 1995. Willard joined Meshek and relocated to Tulsa in July of 2008 after spending the previous 5 years as a Remote Sensing Analyst at The University of Montana in support of wildlife biology research. His favorite things about GIS are the enormous variety of real world applications, and the growing interest it has generated in Geography as a field of study. Talia Gammill - Secretary Currently the GIS Specialist at Cotton Electric Cooperative, Inc., a rural electric distribution coop in Walters, OK. I began my career at Cotton Electric as a CAD Tech in June of 2000. Through many combined efforts Cotton had their entire distribution system GPS’d about 6 years ago which then put me into the GIS field, where my main tasks are to provide all necessary GIS data to help aid the Coop in planning, design, and analysis to improve and maintain our distribution system. I earned my bachelor of business administration in 2008 from Cameron University. Although I have been in this field for several years, I have not had much experience with hands on tasks to help the GIS community. I felt that it was time to broaden my network in the GIS field as well as help others in this field realize that there are many organizations and people locally that are available to give help and information no matter what level of GIS experience you have. I would like to have the opportunity to help our local GIS community with gaining the resources needed to contact and reach out to others like themselves, so that this profession will continue to grow and be readily recognized . Darryl S. Williams - Vendor Coordinator Darryl is a Cartographer with 31 years of service with the U.S.
community. Darryl is also the current Oklahoma Representative for Regional SCAUG. Sohail Hasanjee - Assistant Conference Coordinator Sohail works as the GIS Coordinator for the Oklahoma State Department of Health. He studied GIS at the University of Oklahoma while pursuing a graduate degree in Regional and City Planning and has been working with GIS software for 16 years. His favorite thing about GIS is that it is graphic and worth a thousand words. Maps produced by GIS using complex data appear so simple that his 5-years old daughter thinks she can do a better drawing and coloring job than her dad. Elizabeth Montgomery-Anderson - User Group Meeting Coordinator Elizabeth Montgomery-Anderson is a GIS Specialist for Cherokee Nation GeoData. The GeoData office serves a number of other departments within Cherokee Nation, including Health, Natural Resources, Leadership, IT, and Communications. Elizabeth received an MA in Geography from the University of Kansas and has been working at Cherokee Nation for three years. Her favorite thing about GIS is the ‘gee-whiz’ factor, because it facilitates great communication between groups of people with different priorities and backgrounds. She also is very interested in GRASP analysis (recent favorite). In addition to GIS, she loves Jayhawk basketball and experimenting with the crock pot. Pamela works as the GIS Project Coordinator for Red Plains Professional, a civil engineering firm that is Indian and locally owned. She received a Master’s in Geography at Oklahoma State University and has been working with GIS software for 4+ years. Her favorite thing about GIS is its story-telling ability. It takes the complex and displays it a seemingly simple form. around the world related to GPS mapping technologies and field data collection. He is firm believer of GIS /GPS technology and volunteers his time in educating students and teachers in GIS technology. He serves on several college boards on their curriculum committees. He has been actively involved with GITA in the past and has served as Texas Gulf Coast Chapter President and on their Education Committee. 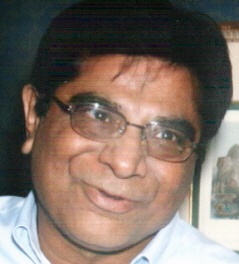 He was awarded the GITA Distinguished Service Award in 2006. He is also on the education committee of the APSG. He has Masters Degree in Business Administration from Northwestern University, Evanston, Illinois., and a Masters degree in Physics from University of Lucknow, India. Shellie Willoughby - Regional Vice President Shellie Willoughby is the current Vice President for SCAUG. Shellie is the GIS Specialist for the Oklahoma Conservation Commission for which she has worked for the past 11 years. She also serves as the Assistant State Geographic Information Coordinator for the Oklahoma Office of Geographic Information. While working for the Oklahoma Conservation Commission she has been involved in the coordination efforts of the Oklahoma GI Council, the Oklahoma Office of Geographic Information and has coordinated the nationally recognized GIS Day at Capitol for the past 8 years. She has a Bachelor and Masters of Science degree in Geography from Oklahoma State University. As a member of SCAUG for 11 years Shellie has served on the SCAUG Board in various positions for the past 6 years as well as held multiple positions in the Oklahoma Chapter of SCAUG. Shellie loves to travel with her family and has been to 42 of the 50 states. Shellie resides in Guthrie, OK with the two favorite men in her life, her husband and little boy. James Allen -Regional Treasurer James Allen graduated from East Central University in 2005 with a Degree in Cartography/Geography. He has been employed as the GIS Coordinator for Carter County, OK for 4 years. 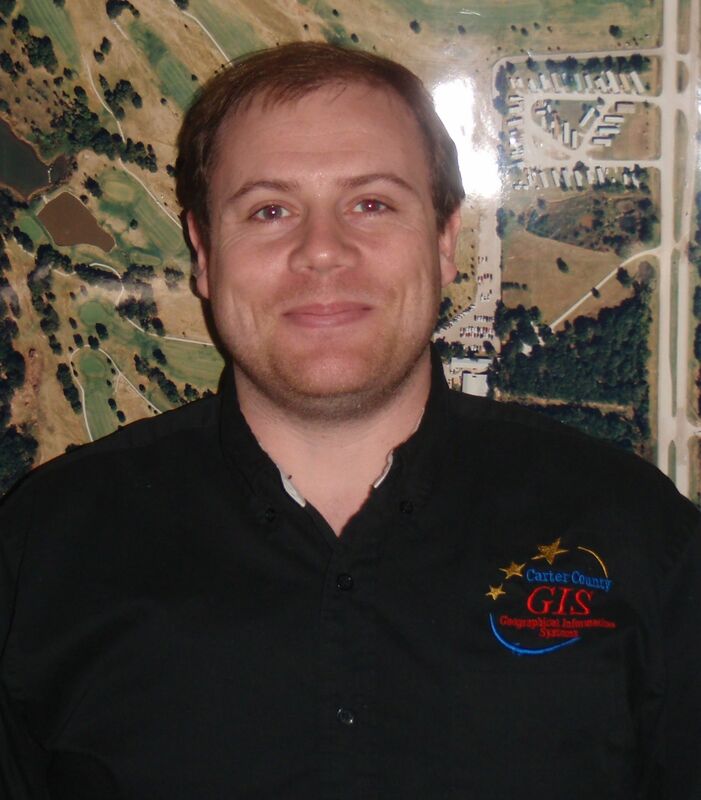 James works with many departments throughout the county assisting in their GIS needs and applications ranging from parcel mapping & addressing to emergency management to name a few. He has been a member of SCAUG for 4 years. Katy Rich - Regional Secretary Katy recently started working as a Senior GIS Analyst for Chesapeake Midstream, a subsidiary of Chesapeake Energy, in their Oklahoma City office. Prior to that she was the GIS Coordinator for the Oklahoma State Department of Health from 2006 - 2010. She graduated from the University of Oklahoma with a Master of Arts in Geography with specialization in GIS and has worked with GIS for 6 years. Her favorite thing about GIS is its usefulness as a tool for countless industries and professions. She loves sharing her excitement about GIS with others. Katy and her husband, Jamie, have two sons, Rowan (5) and Gaian (2.5). Katy is also the Regional SCAUG secretary. Stacia Canaday - ESRI Representative Stacia began working for ESRI in 2002. She is the Training Sales Consultant in the San Antonio office, handling training-related inquiries and sales. She also teaches courses focusing on geodatabases, ArcSDE technology and Microsoft SQL Server. Stacia studied geography and geology at the University of Oklahoma. After graduating, she worked at a GIS consulting company in Oklahoma City, where she was a technical marketer and taught ESRI classes as an Authorized Instructor. 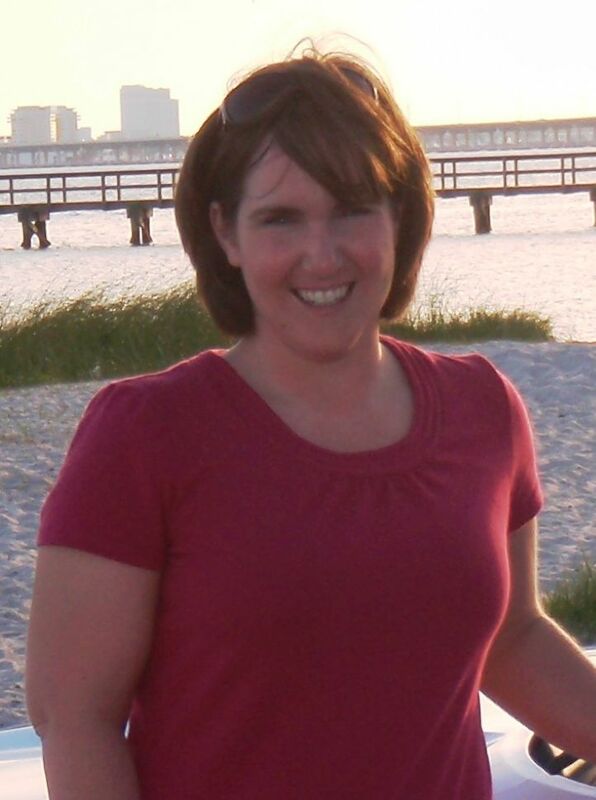 Stacia’s been involved in SCAUG since 2001, both as a member and instructor of the pre- and post-conference classes. 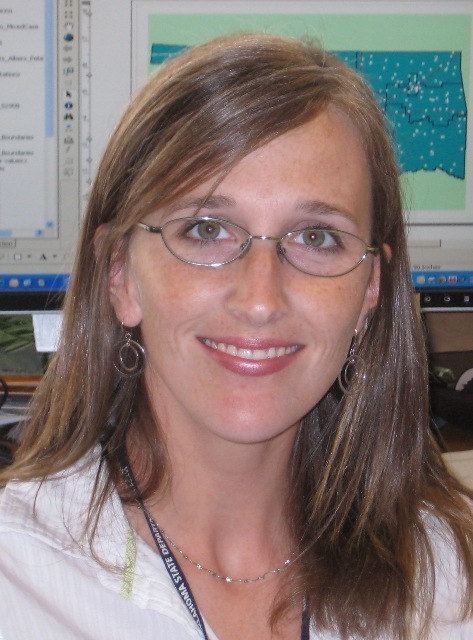 Since 2007, she has served as the ESRI representative to SCAUG. This appointed position is chosen by the SCAUG president and ESRI regional manager. If she’s not teaching, you can usually find Stacia cheering for the Sooners, especially during college football season. She also loves to bake and has been known to bring snacks to share with her students. Her other pastimes include reading, playing with her dog and taking golf lessons from her favorite golf pro (her husband),Scott.